06 Şubat 2019 Çarşamba 12:00 - 2 reads. Daimler has suffered in the past year, an even larger drop in profits than feared. Especially in the Car business, there was fierce against the wind. The shareholders get to feel. You expected a weaker dividend. The distribution will decrease of 3.65 euros in the previous year to € 3.25. Analysts had expected, however, with a 3.45 Euro. Also, the earnings before interest and taxes (Ebit) fell more than experts had expected. So the Ebit in the past year fell by 22 per cent to 11.1 billion euros. Analysts had expected 12.1 billion euros. Below-the-line Daimler earned 7.6 billion euros, three billion euros less than in 2017. The approximately 130,000 employees in Germany this is a smaller Bonus of 4.965 Euro 5.700 Euro in 2018.
revenue climbed in contrast by two percent to EUR 167.3 billion euros, with a slight rise in sales. 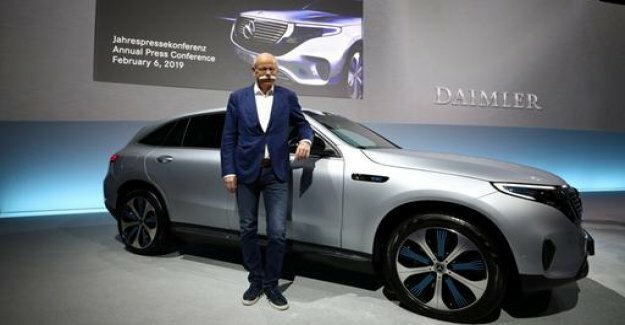 "For Daimler, was a year in 2018, against a strong wind," said Daimler chief Dieter Zetsche to the presentation of its last annual balance sheet, after 13 years in top management. Especially the Diesel discussion, the new emissions test procedure WLTP and the global trade dispute-loaded. The shares of the Dax-group responded in the early trading at a discount of 1.5 per cent on the Numbers. In this case, the paper is collapsed in the previous year, to 35 percent. Especially in the largest field of business Cars the car builders had to contend with high expenses and Special charges. Higher import duties in China compared to the United States in a trade dispute increases in the cost of the SUV imports from America, which dampened the demand and the profit margin decreased. The return of the brand with the star bent around one and a half percentage points to 7.8 percent compared to the previous year and was still below the target mark of the group of eight to ten percent. This is to be achieved in 2021. Until recently, the group had the Ambition to reach at Mercedes-Benz a return of ten percent, and there are six to eight percent. for More course information to Daimler. The smaller trucks division, Daimler Trucks, however, could benefit from a high demand in the United States and increased its operating profit by 16 percent to 2.7 billion euros. CEO Zetsche said in the Morning, Daimler have started to develop comprehensive counter-measures. How exactly should they look like, let Zetsche open first. A reduction is planned, a spokesman said. For the core workforce in Germany are excluded from the conditional dismissal anyway. Last year, Daimler had announced that, owing to the high development investments in the passenger Car division in 2021, four billion euros to save costs. Background among other things, the high level of investment in new electric models. In this year the first car of the new brand EQC comes on the market. this year is expected to be Daimler with the continued high level of investment in planned electric cars or Autonomous Driving, only a slight improvement. Sales, sales and Ebit to increase slightly, which means the result of an increase of more than five percent. The Car-return on sales could still sagging, because the German car industry is undergoing the biggest upheaval in its history. Climate protection and digitization are forcing you to electric and self-driving cars. Mobility services like Car-Sharing or Shuttles are to be the lucrative business of tomorrow. all of This requires a huge investment, while the auto economy in the world, burdened by a trade dispute and Leaving it to cool down. "A profitable business is a prerequisite to be able to in the future, in new technologies and products to invest," said Zetsche. The Stuttgart-based group wants to invest in the next two years, 7.5 billion Euro in the year, and nine billion euros in research and development. At the same time, efficiency measures are intended to keep costs in check.